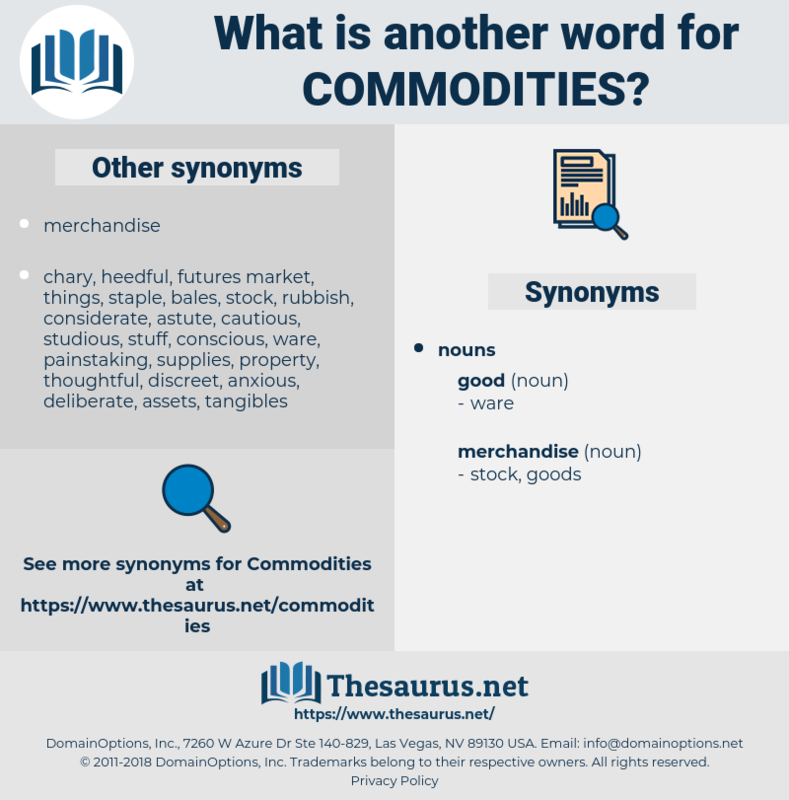 What is another word for Commodities? imports, merchandises, foodstuffs, exports, shipments, Groceries, staples, wares, products. imports, pharmaceuticals, devices, options, NHPS, Weights, deliverables, articles. agricultural, components, deliverables, agri-food, transportation, dairy, Medicines, softwood, industry, portfolio, Delivered, market, compounds, substitutes, objects, article, articles, ornamental, regulatory, retail, METALS, CCCT, transport, equipment, NMB, GST, ocean, china, patterns, wares, GSD, indian, canada. 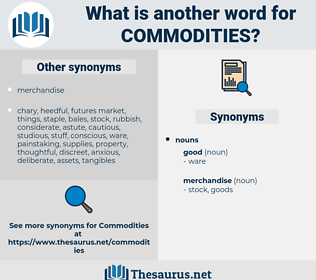 consignments, stocks, constituents, Quantities, consumables, combattants, things, importers, Necessities, matters, commitments, topics, cosmetics, pharmaceuticals, conveniences, importations, utilities, Contraceptives, comforts, by-products, procurements, medications, requirements, collections, contents, manufacturers, feedingstuffs, electronics, Facilities, exporters, specifications, derivatives, Prices, Genders, coatings, Properties, Pesticides, logistics, instruments, receipts, producteurs, textiles, suppliers, tariffs, producers, Industries, Grains, disinfectants, Resources, Fruits, devices, acquisitions, sectors, crops, provisions, development, instances, additives, pieces, gifts, Deliveries, profits, biologics, Categories, minerals, basics, growers, belongings, sections, ingredients, markets, assets, fields, Artifacts, alternatives, Premiums, essentials, segments, services, amenities, types, Herbicides, aliments, basic, Meats, harvests, feeds, appliances, Accessories, effects, biens, sales, fabrics, Artefacts, inputs, generation, allowances, precursors, Cargoes, cargos, purchases, garments, farmers, parts, treasures, ADDUCTS, stores, NHPS, thanks, crafts, produtos, Trademarks, Proteins, subjects, preparations, brackets, futures, clusters, lighters, choices, estates, spheres, titles, agents, tires, Cultures, possessions, arts, bienes, needs, Films, requisites, rule, rules, Beverages, Firms, genres, valuables, Bonuses, Stories, Vaccines, affairs, paints, brands, papers, Prayers, supplements, handbags, clauses, wastes, packages, Ones, therapies, Programs, Areas, earned, offerings, EPPS, weapons, hazards, Branches, Classes, holdings, works, Grants, Walkers, Genera, avails, Patents, deals, cases, sexes, lamps, releases, agricultural, components, deliverables, Medicines, LINEs, compounds, substitutes, articles. imported, collected, Yielded, Descended, developed, Filed, product. His case is not like that of other men, who in their dealings come in competition, and where this competition and the laws of demand and supply fix the prices of the commodities in which they deal. The Reparation Commission is empowered up to May 1, 1921, to demand payment up to $ 5, 000, 000, 000 in such manner as they may fix, " whether in gold, commodities, ships, securities or otherwise."